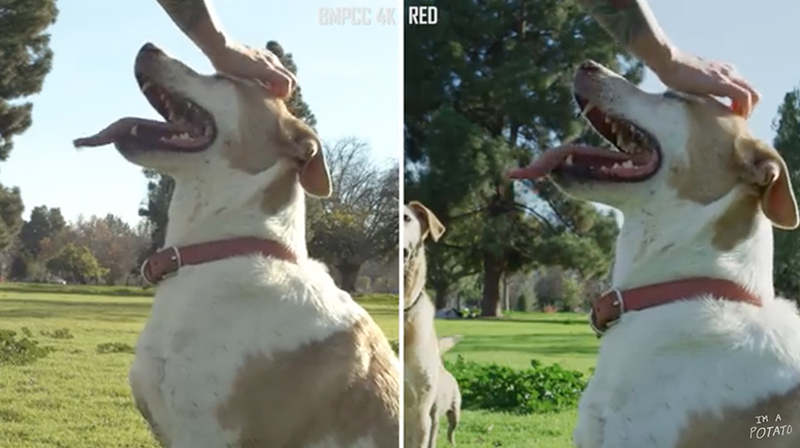 The Blackmagic Pocket Cinema Camera 4K is now officially on the market. 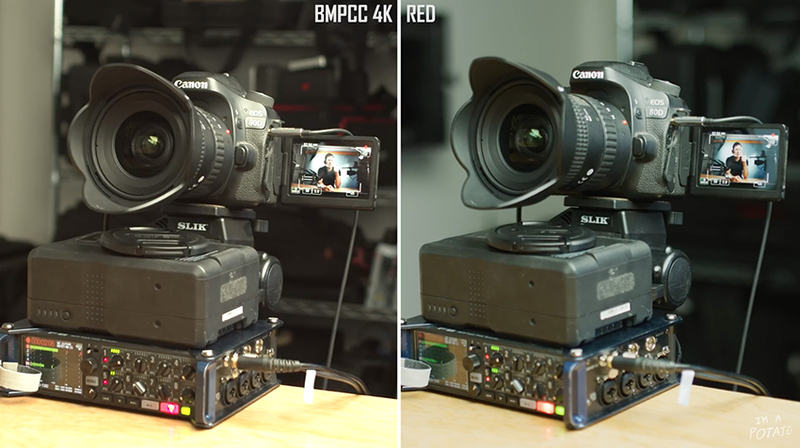 There are indeed been more than a few hiccups for to camera to hit the shelves, but still, it is now available to customers, and that makes it one of the cheapest, if not the cheapest, Cinema Camera on the market. But how good can it be? Without disturbing Her Highness the mighty ALEXA, we shall take a look at the camera getting along with one of the kings in the market, the RED Dragon. 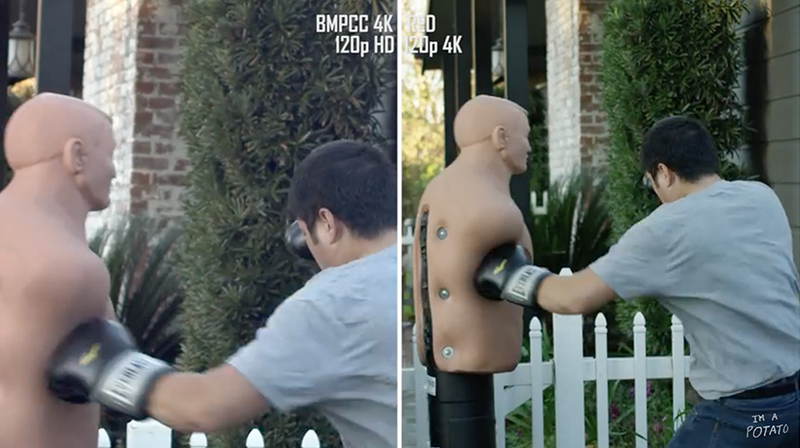 In this comparison, YouTuber Potato Jet puts the two rivals shooting one next to the other to figure out if the Pocket 4K deserves the name of cinema camera. Let’s have a look! 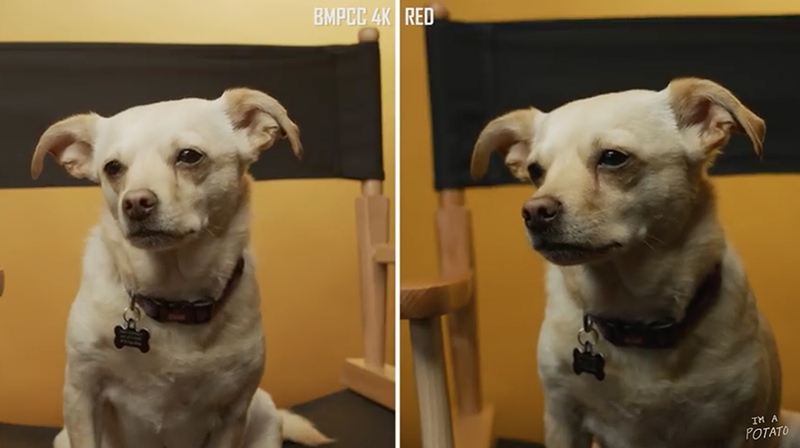 The comparison starts with a quick reel of images shot in rainy and overcast day in LA, but as we get to the first side by side comparison it is immediately apparent that there is a more than slight difference in the color rendition of the two cameras. As you can see in the picture of the Canon 80D, the two rivals offer a quite different tone. 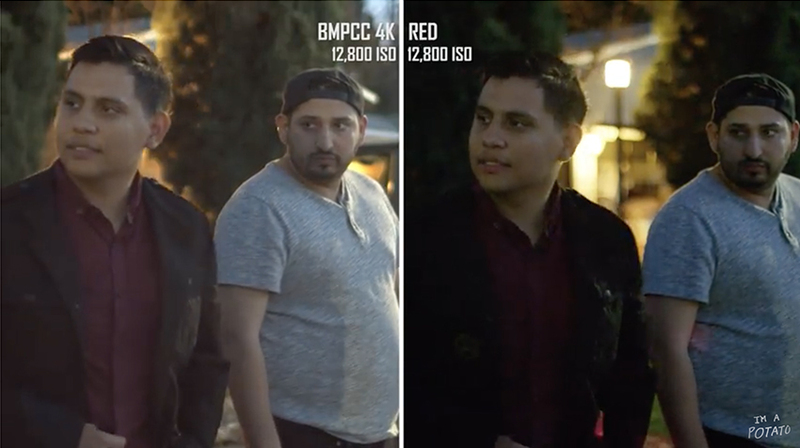 Keep in mind these shot have the same color temperature, that is 5600K, and no tint. 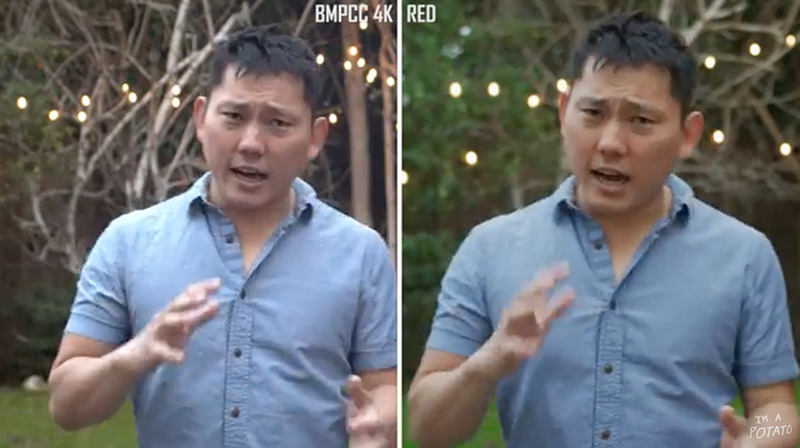 As the camera moves outside for a real-world scenario comparison, it strikes immediately that the RED camera is quite more saturated in the greens. The green of the park is much more vibrant on the RED shot. Instead, the Pocket seems a little bit warmer and yellowish. It is worth to note that the impression of the shooter is that the RED probably delivered a much more faithful image, indeed the grass was very green due to the heavy rain in the days prior, and last but not least, these are the images straight out of the camera, we’ll have data to better judge after a color correction session. After all, it’s cinema cameras we’re talking, and at least a basic correction is implied. The following shot is useful instead to compare the sensor sizes. As you know the RED DRAGON sports an S35 sensor versus the much smaller Micro Four Thirds of the Pocket. It jumps right to the eye the different kind of bokeh you can see in this images, with the S35 sensor having a more soft and pleasant bokeh and consequent separation of the talent from the background, considering the images have been shot at the same f-stop. We go back inside, this time with a studio setup, meaning controlled lights, and off the bat we can see that the images are quite beautiful. The shadows hold a little more contrast in the RED tough, but in fact, it is kind of the RED-style to have that type of mood. The slow motion is the battle that does not need to be held. Powered by a much bulkier and beefed heart, the DRAGON’s brain is capable of a stunning 120fps shot in 4K, de facto crushing the 120fps in FullHD of the Pocket, that falls leaps behind. The sensor crop is very much visible in this shot between the two cameras, but remember that going up to 240fps on the RED will bring a huge crop too. Where instead the Pocket comes surprisingly up on the top is the low light situation. At ISO 6400 the Pocket seems a little bit cleaner, but stepping up at ISO 12,800 it becomes a clear winner. We must note though that the RED lineup offers the Gemini, a camera that is directly aimed at low light situations. Drawing some conclusions, we can see that the Pocket offers indeed some quite sweet positive sides. In the dynamic range, although it is obviously outperformed by RED, to still can manage a heavy lifting in post, more so if you shoot in the film profile, that is the flattest available of the three in the offering. The RED has cleaner greens, and overall better image, but once you factor in the cost that makes the Pocket more or less a tenth of the price of a brain only Dragon, the advantages become outstanding. So, depending on the budget and type of production, having a lightweight camera that you can hide in your jacket and offers an at least comparable performance to a camera that costs as much as many cars is a huge plus. 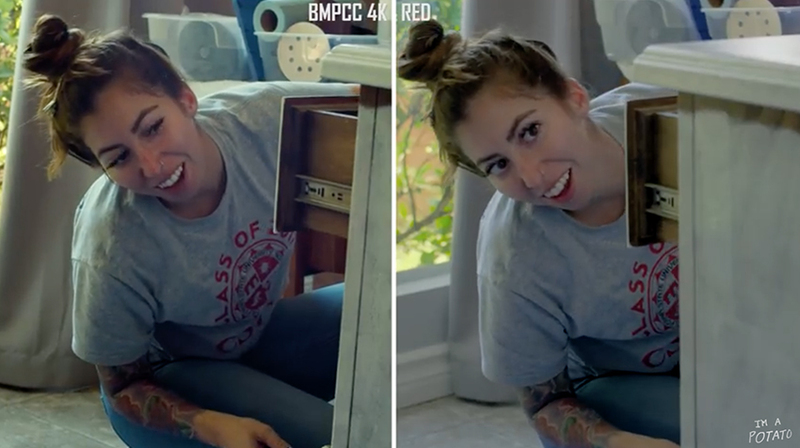 As a closing note, the images we can see in the opening of the video are shot on the Pocket, and although it is, as said, surely not exactly the same quality of the RED, it is with no doubt a quite comparable result.